The Live Events module provides an easy way how to present drawings at your meeting, during the streaming or for other situations. 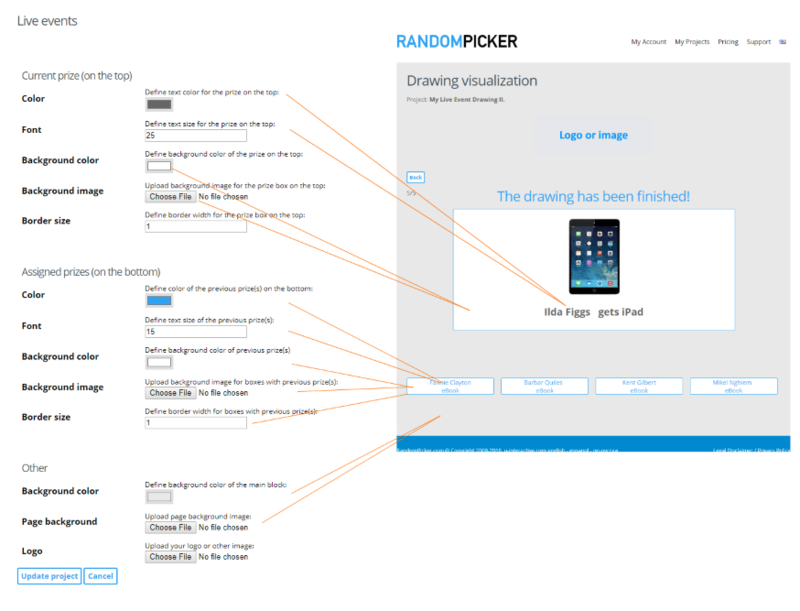 This module uses the same drawing method as common RandomPicker drawings, but it adds the visual layer. We recommend using Live event if you have a raffle with more than one prize. All winners are generated during the initial phase (when you see the turning animated wheel) and in the next phase you can see the presentation of winners. The animation looks much better if you added an image to your prizes (at the Add prizes page). Several attributes can be customized in the Live events module (available for Standard and Advanced plans only). Go to Project Overview > Custom design button > Live Events module section. The background images have the CSS property set to “background-size: 100%”. This means browser will scale the image to cover the whole width of the element (page or box). The time delay between your panel and public view depends mainly on the quality of internet connection. The Live Events module is available for the following plans: Standard Plan, Advanced Plan and RandomPicker for Nonprofits. See Pricing for further details. This module is still in the development phase and we will bring new options and adjustments in the near future.